This easy recipe for homemade Healthy Pumpkin Muffins is quick, simple, and the best. They’re naturally sweetened, low calorie, low fat, and kid-friendly. The perfect Fall breakfast recipe for using up pumpkin puree. It’s October everyone! Wow, time really flies. I swear school just started and now it’s been a whole month. Now that fall season is here it’s time for all things spooky and all things pumpkin. I hate the cold weather but I do love watching the leaves change and watching them turn into beautiful colors and falling off the trees, and I also love having healthy pumpkin muffins for breakfast. I remember, many years ago, I used to think that making pumpkin muffins from scratch was so hard. The only types of muffins that I used to make were banana muffins. In fact, I used to be so skeptical about baking with canned pumpkin puree. I really was! I grew up in the Caribbean so baking with pumpkin seemed very odd to me. But the minute I tried it, I was hooked! I’ve also come to love baking with Greek yogurt. I used to be so skeptical about that too. But baked goods with Greek yogurt always turn out so soft. These low fat, pumpkin Greek yogurt muffins are definitely one of my favorite breakfast recipes to date. And with all the (sugary, fattening) baking that happens in Fall and around Thanksgiving, this healthy pumpkin recipe is one you won’t feel guilty about. This recipe has all of the great flavors you love when it comes to pumpkin muffins but without all of the extra calories. 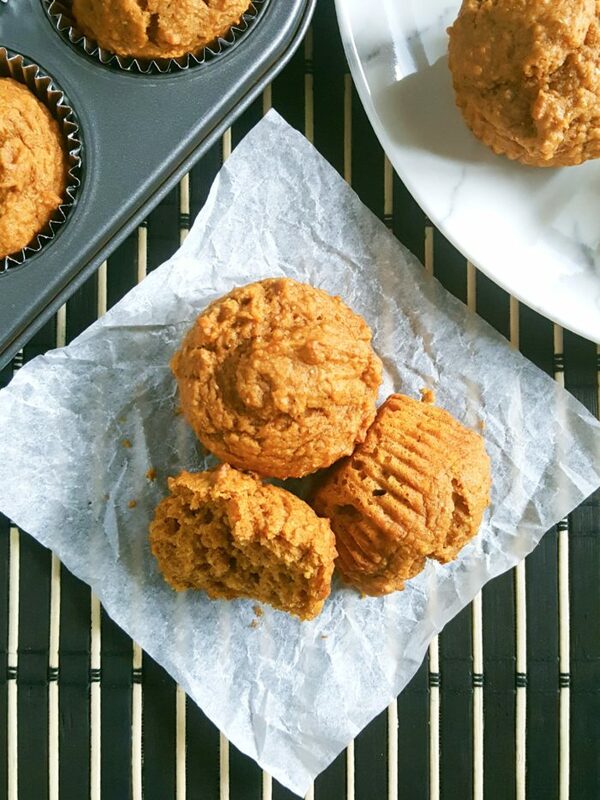 These low calorie pumpkin muffins are made with one whole cup of canned pumpkin puree. Oh, yes. We’re not skimping on the pumpkin flavor today my friends. They’re also made with vegetable oil and Greek yogurt which makes them so soft and moist, and they have no sugar in them. 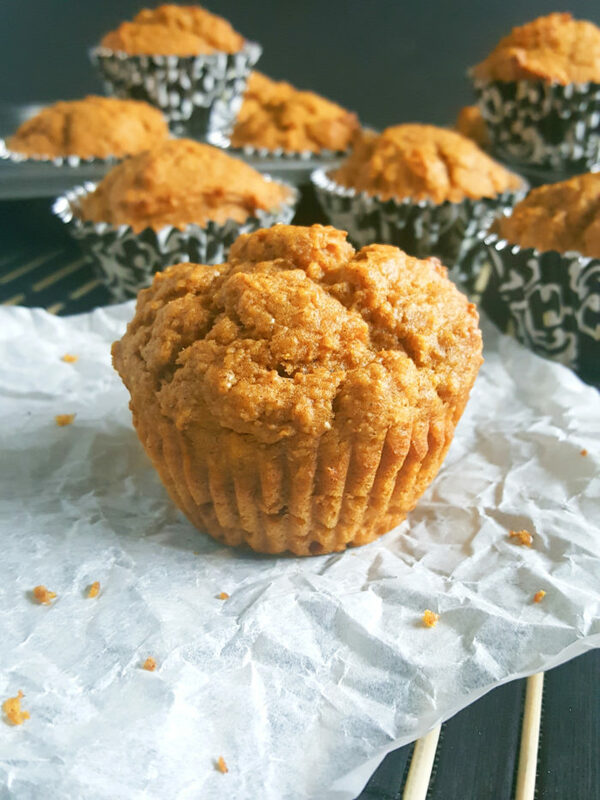 I try to use the word “best” sparingly but this is just the best easy healthy pumpkin muffin recipe ever! 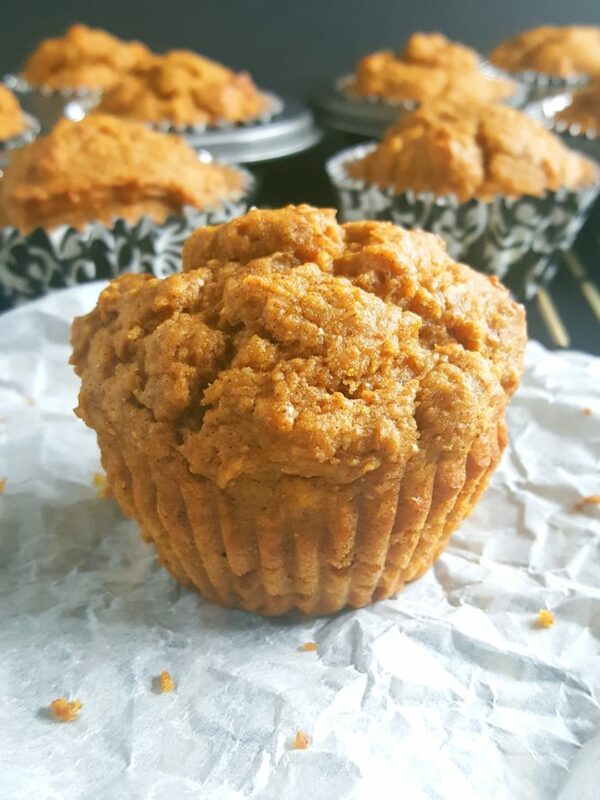 Pumpkin puree – you can’t make these muffins without pumpkin puree so grab a can or make your own. Maple syrup or honey – perfect all-natural sweeteners that are much better for you than refined sugar. Greek yogurt and vegetable oil – for softness and moisture. Vanilla extract and salt– for added flavor and to enhance flavor. Whole wheat flour – for fiber, health, and lower cholesterol. Woo! Cinnamon and nutmeg – spice and all things nice. Baking soda, baking powder, and one egg– for leavening, structure, and texture. These muffins are pumpkin puree muffins. They’re not made with filling so make sure that your can of pumpkin puree says ‘100% pumpkin’. You don’t want to end up using pie filling in this recipe because it’s much sweeter and that would defeat the whole point of these muffins being healthy. Because these healthy pumpkin muffins with yogurt are made completely without sugar I had to substitute with maple syrup or honey. Feel free to use whichever one you want. It doesn’t really matter. They just act as a sweetener. 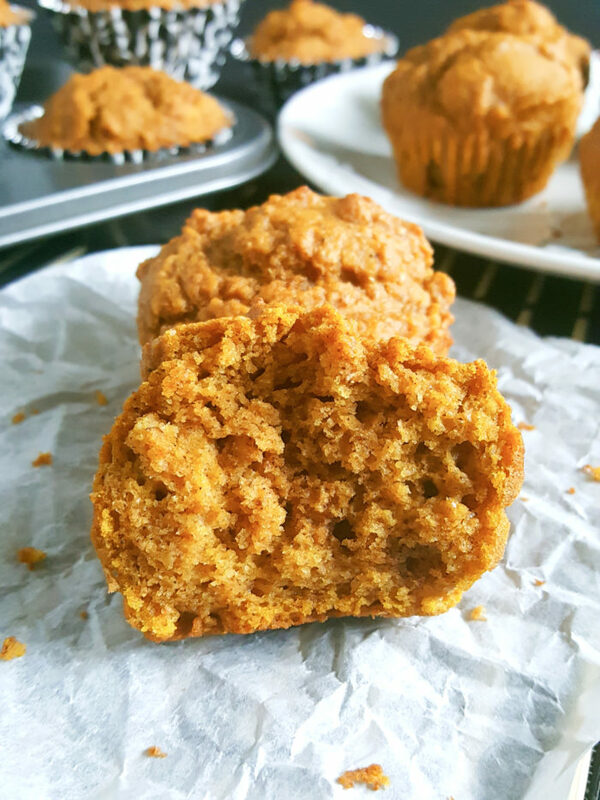 I used maple syrup because I absolutely love it and I love anything maple-flavored (even though the pumpkin kind of overpowered it in these muffins). And I made sure to put 2 teaspoons of vanilla extract in this recipe to really amp up the flavor. Maple syrup is so expensive though. Damn… but it’s definitely worth every drop! For those of you who aren’t accustomed to baking with Greek yogurt you might be wondering why use Greek yogurt and not just regular yogurt? Well, Greek yogurt has less lactose which means that it contains less sugar than regular yogurt. 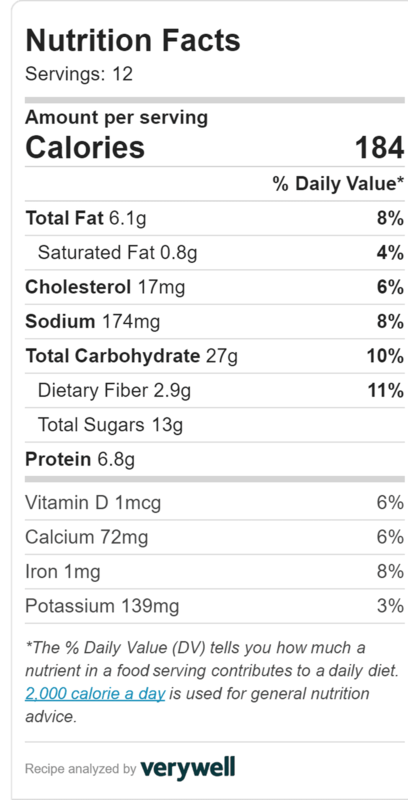 And while it is much denser, it’s lower in carbs, lower in fat and high in protein. It also has a slightly tangy flavor to it which pairs well with sweet baked goods. I chose to use 2% Greek yogurt in this recipe because it’s full fat and is therefore richer in flavor. I don’t recommend using nonfat Greek yogurt because it would most likely change the taste and the texture of the muffins. You can use either plain or vanilla yogurt for this recipe. Quick tip: If you don’t have Greek yogurt on hand you can also use sour cream. I know that it’s higher in calories and not as healthy as Greek yogurt however, it’s a great last resort alternative. And because of the Greek yogurt and the oil there is no butter and no milk in this recipe. Oh, and these healthy pumpkin muffins have no oats. 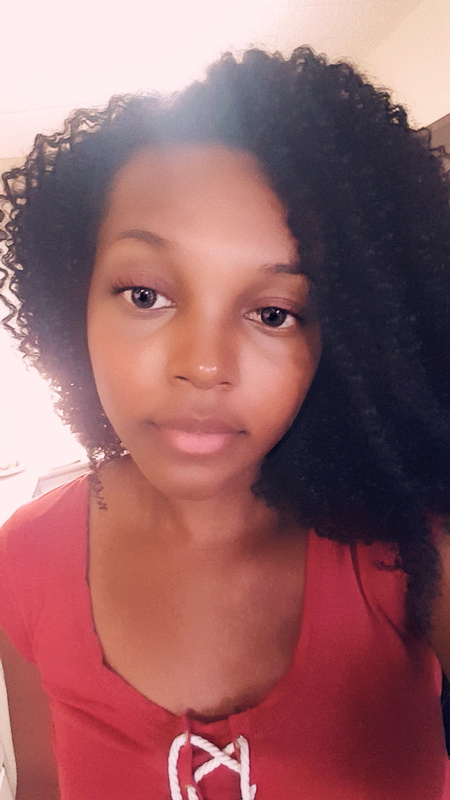 I thought of adding them for a split second but I decided not to and I’m very happy with my decision. Even though this is a two-bowl recipe it’s still quick and easy to make. Preheat your oven to 350°F. Prep the muffin pan and set aside. Combine the pumpkin puree, maple syrup/honey, and greek yogurt in a large bowl. Beat in the oil, egg, and vanilla extract. Whisk together the dry ingredients (the remaining ingredients), add them to the wet ingredients and stir until incorporated. Evenly distribute the batter between the 12 muffin cups and bake. See? Simple steps. Making healthy pumpkin muffins is quite easy so prepare yourself for the aroma that is going to fill your kitchen. You’re going to love it! The batter for this recipe is quite thick because there’s not much liquid but it makes it very easy to scoop into the muffin cups without making a huge mess. I’m guilty of this sometimes. I must say that these muffins baked up perfectly. I baked mine for 20 minutes but I suggest that you check them at the 18-minute mark just to be safe. When these homemade muffins come out of the oven they’re not going to be the prettiest things you’ve ever seen, but they sure will be one of the most delicious! They have big bumps and they look like if they were to be thrown, they could cause some damage, but they’re actually really soft. You’ll see what I’m talking about. These muffins are so good fresh from the oven though. I mean, all muffins are great fresh from the oven but these are amazing. You can say that these orange-tainted beauties are like little pumpkin pie muffins. If you’re not able to have them right away or if you’re having them for breakfast the next day, feel free to reheat them in the microwave. That’s exactly what I did. If you’d like to use pumpkin spice in place of the cinnamon and nutmeg go right ahead. I’m sure it would make these muffins even more delicious. Also, I only used one egg in this recipe because I’ve noticed that pumpkin recipes don’t need much aeration. In fact, you can even replace eggs with pumpkin puree. They’re actually used as an egg substitute in recipes all the time. I didn’t even know this until recently. Can pumpkin muffins be frozen? Yes, they can. They can be frozen and then thawed at room temperature or you can heat them in the microwave for about 20 seconds or so (it will depend on your specific microwave). You can also reheat them in the oven by wrapping them in foil and baking them at 350°F for 10 – 15 minutes or until they are completely warmed through. You can store these pumpkin muffins in an airtight container or zippy bag. They should keep for two days. 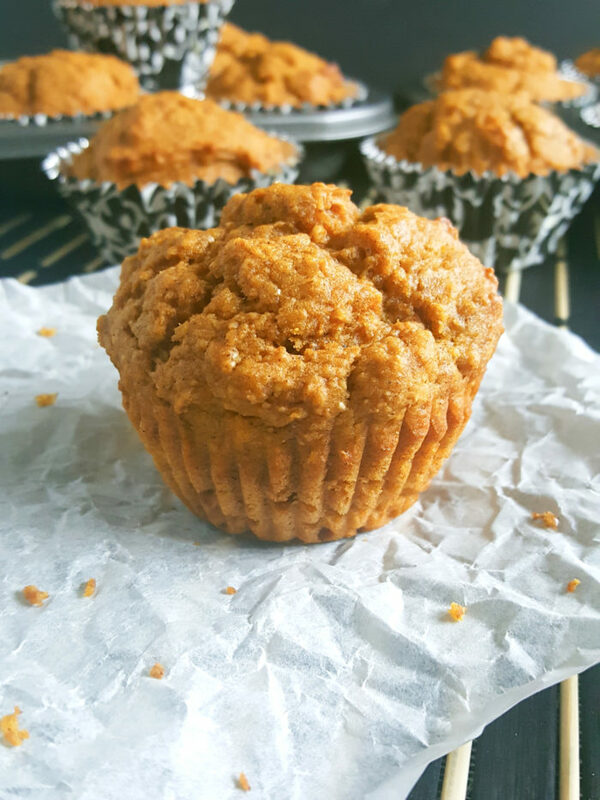 Although it seems far away, Halloween is actually right around the corner and so these muffins are great for a healthy pumpkin snack that you don’t have to feel guilty about or have to feel bad about giving to the kids, especially after they have all of that candy. They’re great for the Lunchbox since they’re sugar free and high in fiber. I’ve said this before but, I love healthy muffins. I think I love them more than white flour muffins because muffins made with whole wheat flour are so much more filling. And I know if you’re new to the world of baking with whole wheat flour they can seem like they have a harsh texture but they don’t if you put the right ingredients in your recipe. They can actually be really delicious and much tastier than regular muffins. And these muffins are so fluffy and scrumptious that your kids, or your toddler, will not care that they’re made with whole wheat flour. They are that magical. They can convert anyone. 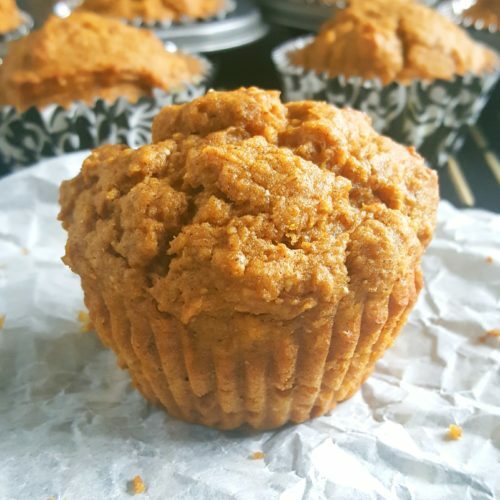 This is going to be your new favorite healthy pumpkin muffin recipe because it’s so easy to make and really delicious too. You definitely need to add this one to your list of easy pumpkin recipes because it is packed with Fall flavor despite it being a healthier breakfast option. It’s just perfect and that’s why it’s the best. If you’re looking for a healthy, low calorie, canned pumpkin recipe, this is a great one! There’s a few more whole wheat flour muffin recipes here on Beat Bake Eat. You should check them out! You gotta love easy baking recipes. As soon as Fall hits I always like to keep a can of pumpkin puree in the house because there’s lots of canned pumpkin recipes to be made, especially the baking kind. I’m currently brainstorming new pumpkin puree breakfast recipe ideas, so if you think of any good ones please let me know in the comments below! I might end up doing more recipes of this kind because I love homemade healthy muffins, especially when they’re low fat and sugar free. They always make for a guilt-free breakfast. It seems that when I get started with the healthy pumpkin breakfast recipes, I don’t stop. Preheat oven to 350°F. Line muffin pan with muffin liners and set aside. In a large bowl combine the pumpkin puree, maple syrup/honey, and Greek yogurt. In another large bowl whisk together the flour, cinnamon, nutmeg, baking soda, baking powder, and salt. Add the dry ingredients to the wet ingredients and stir until incorporated (batter will be thick). Do not over mix. Scoop the batter into the muffin pan distributing it evenly between the muffin cups.